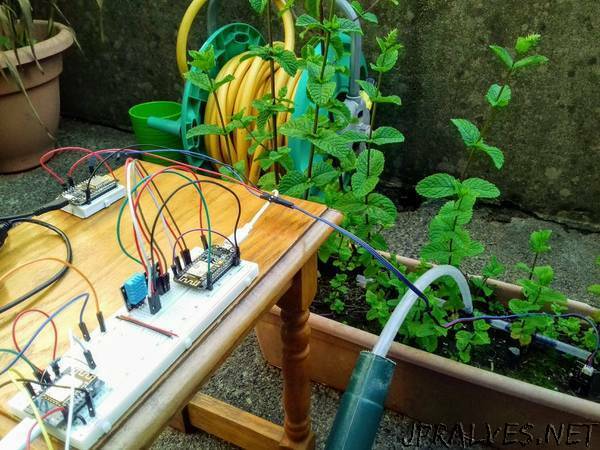 “A Py/mPy auto irrigation system with push notifications to Android, and rainfall prediction with Darksky API for more efficient water usage. The idea of this tutorial is to provide examples of how to read sensor data with MicroPython devices. Then how to do some useful stuff with that sensor data, using a RPi running its bigger sibling, Python. You will find examples of code that can be used for measuring distance (Water Level), controlling relays (The Pump), Soil Moisture (Capacitive Soil Moisture), Temp & Humidity (DHT11) and Light level using a photoresistor. The RPi code shows how to send Push notifications, write data to a Google Sheet, request weather forecast data from Darksky and how to use HTTP requests with a web app to monitor and interface with your mPy devices. Secondly, to build an example code framework which can be quickly and easily modified to use for all future mPy projects. The setup being infinite mPy children contacting a Flask parent, who performs the complex functions the children cannot. This framework includes a standard boot.py for the children (Connect to WiFi, use NTP to set time) and a list of the definitions which need to be added to the parent web app to allow a new device to connect. The mPy nodes have the ability to transfer information between themselves using HTTP requests, i.e. one board takes the soil moisture level and reports to the server, another board then requests this information and uses it to decide whether to run the pump or not. On the subject of water conservation, the pump controller is also able to request the weather forecast from the Pi. When the Pi receives this request, it contacts Darksky for the precipitation probability for the next 24 hours. The pump controller again uses this information to decide whether to run the pump or not i.e. if its going to rain before tomorrow’s watering cycle, don’t pump. The pump I used was a tiny USB aquarium pump. Its a submersible pump and if it runs dry it will burn out. To prevent this I put a hcsr04 ultrasonic sensor at the top of the water tank to measure the distance to the top of the water. This is where the push notifications come in, if the pump is prevented from running by a low water level, the mPy board will contact the RPi, who will then send a notification to my phone using Slack.